Buy Crystal Containers Golf Awards to give to your winners for your next golf tournament, event, or outing. 4. 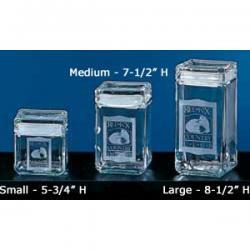 Your Crystal Containers Golf Awards will be produced and shipped followed by a tracking number sent by email. Custom Etched Logo Fairway Decanter Cut Crystal Golf Awards. Our popular Fairway Decanter is perfect for serving drinks at the 19th hole! This classic-style piece is crafted of hand-blown non-lead crystal and features our signature Fa.. Custom Logo Barclay Glass Bud Vase Golf Award. Our Barclay Glass Bud Vase is the perfect combination of strength and beauty with its machine-made glass construction and elegantly tapered design. Your vase comes packaged in an attractiv.. Custom Etched Logo Golf Award Crystal Biscuit Jar. Our crystal clear biscuit barrel is the way to display all your favorites. Superb, mouth-blown crystal with unlimited usage. Make great gifts for your next golf tournament. Personaliza.. Custom Etched Logo Golf Charity Event Crystal Candy Jar Awards. Crowned with a crystal golf ball, our Player\\\'s Cache offers a personal touch. Take it home or use it at the office for storing tees, paperclips, mints, etc. For best appeara.. Etched Glass Oxford Golf Vase Award - Golf Tournament Gifts..
Mondrian Personalized Crystal Box Golf Awards - Golf Tournament Gifts..